The Cambridge Companion to Shakespeares Poetry. Ed. Patrick Cheney (Cambridge: Cambridge University Press, 2006). Pp. viii + 295. Paper £ 15.99. With the publication of Colin Burrows Complete Sonnets and Poems (Oxford Worlds Classics, 2002) Shakespeare studies entered a new phase of criticism, as Burrow became the first editor since the nineteenth century to print the full corpus of Shakespeares poems in a single volume. 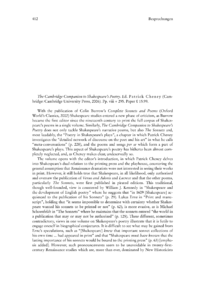 Similarly, The Cambridge Companion to Shakespeares Poetry does not only tackle Shakespeares narrative poems, but also The Sonnets and, most laudably, the Poetry in Shakespeares plays, a chapter in which Patrick Cheney investigates the detailed network of discourse on the poet and his art in what he calls meta-conversations (p. 228), and the poems and songs per se which form a part of Shakespeares plays. This aspect of Shakespeares poetry has hitherto been almost completely neglected, and, as Cheney makes clear, undeservedly so.